My cousin Anne-Marie St-Jean wrote to me to let me know that there was one another Catudal who saw battle in WWII and that was Armand Donat Lucien Catudal (1919-1997) who served as a captian in the Royal 22e Regiment in WWII. I had added that information to my book but had not added it here. Anne-Marie sent along several pictures of Donat and of his headstone. She was able to identify a picture from my last post as being of Donat Catudal. Please view my last post to see the whole picture. A big thank you Anne-Marie! Nice to hear from family in Germany. Donat Catudal was one of my uncles, whom I was very fond of, and who was close to my father Eusèbe. Donat indeed served during WWII in Germany and was wounded, although not seriously. Thank you for posting your discoveries here! Always looking forward to reading it! Hi Judy I would like to comment on the two pictures of Donat Catudal. The one on the right of the screen is a picture we have of my husband Real's father Donat. After looking at the two pictures posted Real has a question of the picture on the left as to weather it is his father Donat. The reason he is question this picture is the military hat he is wearing, the emblem on the hat should be the same in both pictures as that was the unit he served in while in Germany. Right now I am on holidays. When I get back I will try to find out more. Thank you very much for bringing this discrepancy up. I very much appreciate your comments. I'll be back in a week. I have some follow-up information for you. You brought up a very interesting observation regarding the discrepancy in cap badges worn in the two pictures of Donat and questioned whether this could be the same person because of this discrepancy. I am going to write a blog on this issue but just short here: I believe it is the same person for a few reasons; the discrepancy in the cap badges could be due to the fact that Donat was promoted to Captain status and may have been given a different cap badge to distinguish him above the others. Second, the two men look very very much alike. Third, the two other men in the photo which is shown in an earlier blog also are from the same regiment R 22e R and each has a different cap badge. And, probably most significant, I found the picture in the Catudal family picture albums handed down to me from my grandmother who recently passed away. Donat was my grandfather's 1st cousin. This makes it more likely that it was Donat. I have spent quite a bit of time trying to find out if the Royal 22e Regiment indeed had a special cap badge for officers just to be sure and have not been able to find anything but will continue to search. I am also going to send the picture to a couple of cousins who come from this side of the family. What makes me a bit uneasy is that your husband Real is not sure if the picture on the left is of his father. He would be the best person to say if a picture is of his father or not. Is it only the badge that is throwing him off? Wondering if we are talking about the same Donat. Yes Donat served in WW2 but his top rank was Corporal. The reason is he enlisted and his education was maybe Grade 2. It would have been hard for him to make Captain because of that. The picture on the right is a picture we have in our family album, we go and visit his grave site when we are in Granby. Also the more common name of the regiment he was with was the Vandoo's. 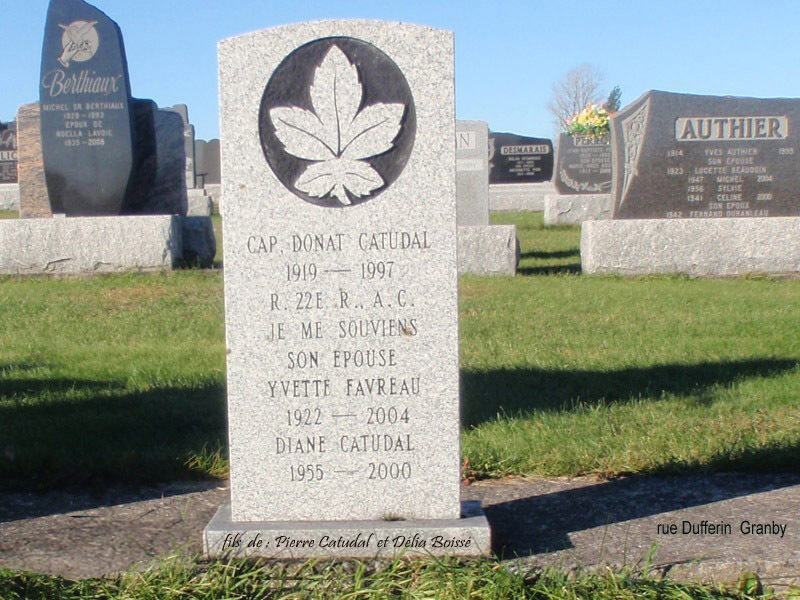 Donat Catudal fils de Pierre Catudal alage de 20 ans dans le Royal 22ieme Regiment de 1939-45. Pierre Catudal nais: Mars-1867, Valcourt, Remarque: Il est decede du coeur, mariage: 03-Aout-1896, a Valcourt, Delia Boisse, nais: Aout-1880, Stukeley. (fille de Jean-Baptists Boisse et Celina Couture) Remarque: 12 enfants, deces 22-mai 1934, Granby a 53 and 9 mois. Pierre deces 19- sept- 1929, Valcourt a 62 ans 6 mois. We are talking about the same Pierre Catudal - Armand Donat Lucien Catudal (1919-1997). The reason I said that Pierre reached the rank of Captain is because his headstone has the inscription "CAP. DONAT CATUDAL". I didn't take into account that the French word for Corporal is Caporal making the acronym of CAP a likley acronym from the French word of Caporal and not from the English word Captain. Thank you for questioning the rank, otherwise I would have let my English background cloud my interpretation of this acronym, something I fear happened all too often by the English when they were transcribing French data. Just a very slight correction on the dates you mentioned: You have Donat's wife Yvette as having been born on 31 August 1922. Yvette was born on 30 August 1922 and baptized on 31 August 1922. My grandfather's name was Adelard Catudal (1900-1983). His name at baptism and on the 1901 Canadian Census was Napoleon but was never called that in day-to-day life. His parent's were Barthelemy Catudal (1864-1937)and Josephine Isola Agnes Boisse (1877-1962). 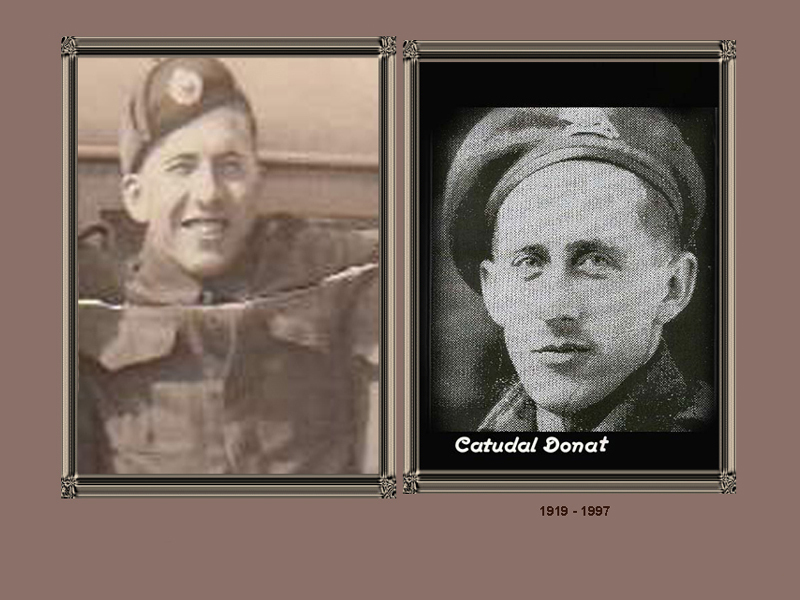 I too am not sure that the photo on the left is of Donat either and it isn't because of the cap badges being different but rather because of the style of the cap itself. I am still looking into uniform dress and cap differences. I do know that the person on the left hand side picture is wearing the standard uniform that all army personnel wore after 1939 until war's end. I just don't know 100% if the hat was a part of all standard uniforms. I have my doubts. you will see a picture of Master Corporal Chrisitan Duchesne with the R 22e R company who recently was killed in Afghanistan. You will notice that his cap badge is different than the standard cap badges. I still think that rank had something to do with the badge being different. In fact, although the cap badge in the picture on the left is hard to see, the outline looks very much lik MCpl Chrisitan Duchesne's in the picture from the above Web site. Do we as Catudals have a Native Indian heritage or not?